As far as I am concerned, the state of mainstream comics, that is Marvel and DC, is in somewhat of a state of horrible flux at the moment. When I was a kid (yes, it’s going to be one of THOSE stories), comics were up to high numbers in their issue count, but those high numbers don’t count anymore as the companies seem to think that high numbers deter new readers from buying the product, but in a world where the movies and TV shows seem to be more popular than the reading matter, I find that that doesn’t really matter anymore. DC make attempts to reinvent itself every couple of years, and the New 52 was a (now aborted) idea which took everything in the DC universe and completely rebooted it after the events in a company crossover called ‘Flashpoint’. Funnily enough, I was booted from a comic forum as I dared to suggest that seeing as how DC were focused on the number ’52’ that it would only last a little over 4 years (52 months). I was right, and Convergence, another company crossover, cleaned the slate again, except for the stuff the fans accepted, so basically the DC universe is now built around popularity rather than creativity. Anyway, enough of my old comic fan whinging, and onto the review of Justice League Dark Volume 1: In The Dark! Justice League Dark went for about 40 issues and looked at the heroes who are responsible for the darker, more magical villains that may attack the DC universe. This collection contains the first 6 issues of the regular comic collected into one softcover volume. It also contains character sketches by artist Mikel Janin. The interesting thing about this comic is the abandonment of the Vertigo adult imprint that DC once championed to return these characters back into the regular DC Universe, and as far as this collection is concerned, the name Justice League Dark is the name of the comic, not the actual group. The group, in this book, contains Zatanna, Deadman, Shade the Changing Man, John Constantine and Madame Xanadu. There is also special appearances by Superman, Wonder Woman, Batman and Dove. Story: This first book is written by Peter Milligan who is responsible for one of my favourite 2000AD comics of all time, Bad Company. Over his career he has worked for many comic companies, including Eclipse and Marvel, where he did the insane and awesome X-statix with Madman’s Mike Allred. Over the years I have read much of his stuff and been in awe of it… but not this time. 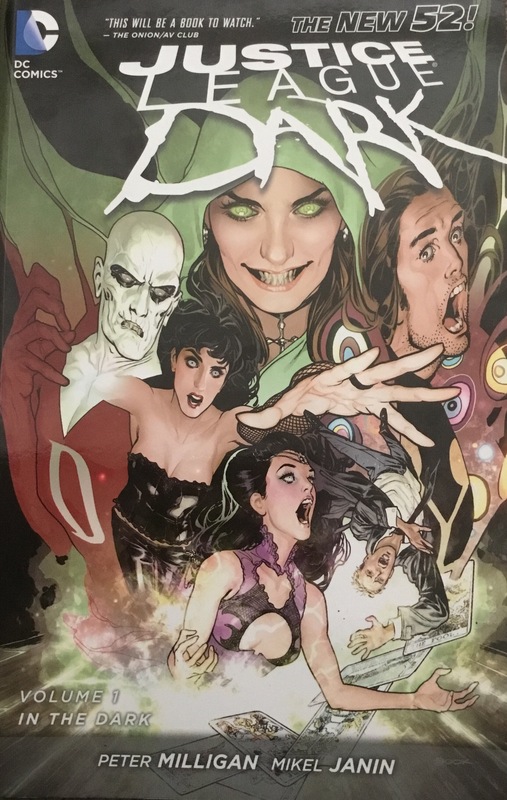 This collection of Justice League Dark really tells of the origin of the JLD, and how their formation is caused by the insanity of June Moon, who has been separated from her Enchantress alter-ego. The regular Justice League attempt to intervene in her threats, but Zatanna brings a stop to that as she knows the forces of magic are above that of the JLA. Like I said, I normally love Milligan’s quirky ideas and writing, and whilst the script in this story is good, I found the story to be lacking something me the character combination to be lacking any cohesion. Was that the point? Maybe, but for me it made for awkward storytelling. Art: The art in this collection is done by Mikel Janin, a Spanish former-architect who has been in comics since 2010. His artwork is of a very European style, me all the characters, male and female are beautiful examples of physical excellence. His layouts are clear and tell the story with some visual excellence. I find his artwork to be reminiscent of Milo Manara’s, but with less genitalia. The cover by Ryan Sook is cool too, though I find his art occasionally to be derivative of Adam Hughes or Terry Dodson. That means it pretty awesome though. WIRIA: I probably won’t read this again, but I certainly will revisit the artwork as I found Janin’s style compelling.